And to my delight this new patch completely resolves all of them. Let’s take a quick peak at the results. 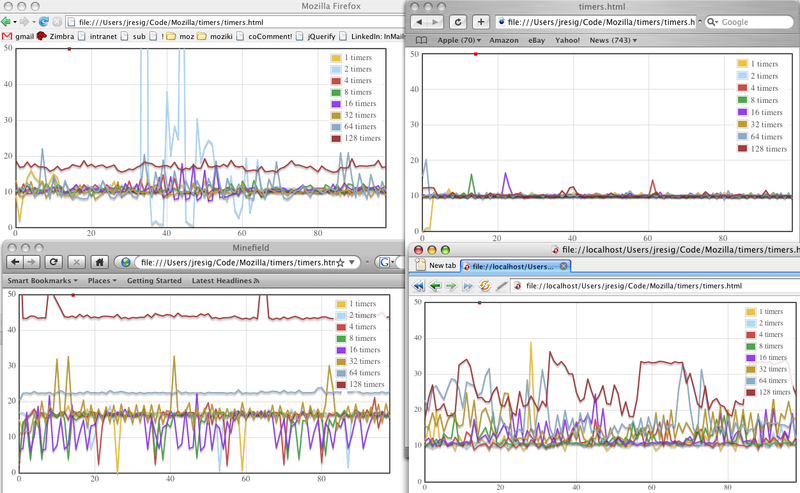 These are the results of doing setInterval(fn, 0); in Firefox 2, Safari 3, Firefox 3, and Opera 9. Firefox 3 is in the bottom-left corner, note the improvement. The change in quality is startling. It’s easy to say that Firefox 3 and Safari 3 are quite comparable now, in terms of overall timer quality and, if nothing else, a major improvement over the timers in Firefox 2. If you want to try this improvement for yourself feel free to download a nightly of Firefox 3 and head on over to the timer test page, I think you’ll be quite pleased. Great to see Firefox improving timer performance, looking forward to smooooooth animations. What Opera version did you test? Supposedly Opera 9.5 brings quite a few performance improvements and should be, in terms of release dates, most likely the one to compare to Safari 3 and Firefox 3. 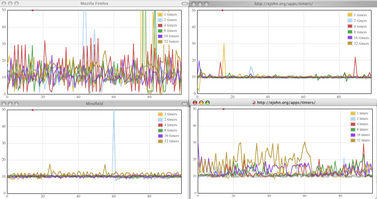 Those after graphs show Firefox to be worse not better. The peaks before were generally under 20 and now they are often over 20. 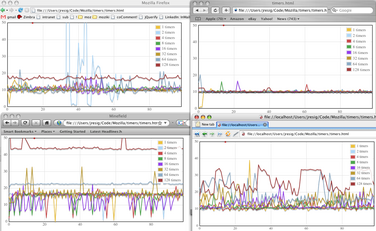 Excluding the last 2 result sets (64 and 128 timers) distorts the graphs a lot. I’d call higher timer variation a reduction in quality, and by excluding the higher values we have no idea how the scalability of timers has changed in Firefox. 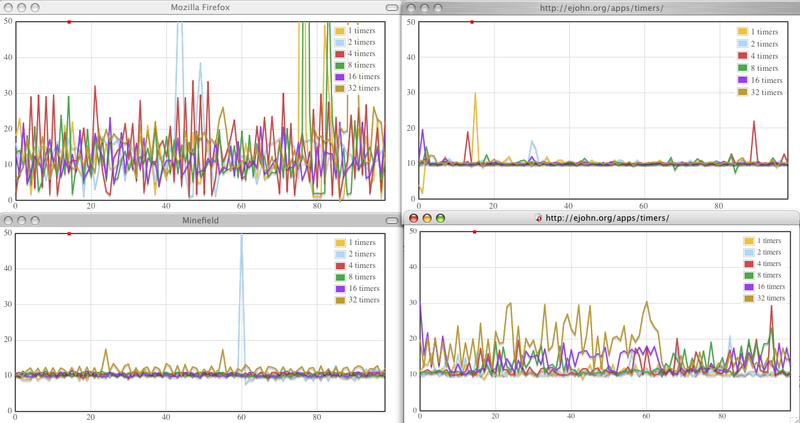 @Alex: The interesting graph is the Minefield one (FF 3), not the one of Firefox 2.x. I’m seeing different results, John. Is it a Mac/Windows thing? The setTimout results are more promising, though. Ah my bad, sorry about that. It would still be good if the graphs actually contained the same number of entries though. @Kevin H: Yes, this change is specific to OSX.